Introduction: When in the tackle store shopping for your next fishing rod, what factors weigh into your decision whether to buy one rod over the other? Do you have a specific technique or species of fish in mind? Do you want something general purpose or tailored to one presentation? Do you have a specific brand in mind, or do you have a list of requirements a manufacturer must meet in order for you to consider their product? Do you care about country of origin, craftsmanship and detailing of the rods you purchase and how about the components that are used to build the rod? Maybe you have some extra cash in your pocket or want to celebrate a big moment in your life and just want to buy something cool! What do you look for when shopping for a new stick? 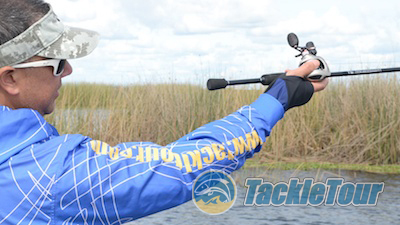 Here at TackleTour, our answers to these questions is invariably "yes". In some shape or form, all these points matter and they all weigh in on our personal buying decisions. Considering just about every product we purchase for ourselves ends up in a review, most of these points also find their way into our review of products. Would this rod catch your attention? At ICAST 2013, we got into a thought provoking discussion with one manufacturer known more for their production of blanks and rod components more so than built rods. This is understandable since they don't really offer any built rods direct to the general public. Who are they you ask? Well have you heard of Alps rod components or maybe Rainshadow Blanks? If you said yes to either of those, then you're already familiar with the quality products from Batson Enterprises. Background: Batson is an original equipment manufacturer (OEM) source for rod components, blanks, and yes, even built rods to manufacturers worldwide. As a showcase for their capabilities, they built up a bass fishing rod that'd be priced generally in the $150 - $170 range, and sent it over for us to have a look. It is built on their Revelation blank and with their very own ALPS components. Since this is not a product available direct to the general public, a review doesn't make sense. 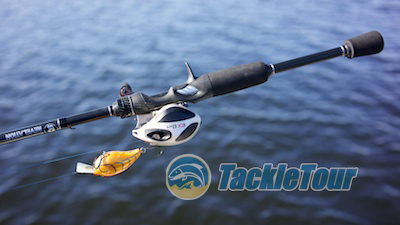 Instead, we thought we'd mix things up a bit and show you the decision making process some of us TackleTour editors go through before deciding on a rod purchase and we'll use this Revelation rod by Batson Enterprises as our point of reference. This rod isn't available to the general public, but all its parts are. This was built on a 7'2" medium powered blank. Part of Batson Enterprises' Rainshadow Revelation lineup. Power: Unless you're in a store just looking for deals or investigating what's new and exciting, you really need to consider what power rod is going to fulfill your needs. Are you looking for one rod to do a lot of things or do you have a specific purpose in mind? 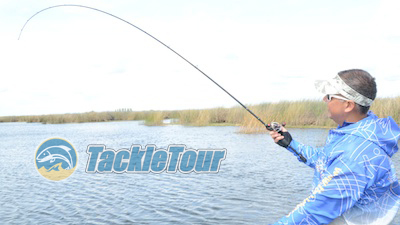 A medium powered rod, for example, is relatively versatile, but only if you're fishing in open water. A heavy powered rod will get you through a lot of tough cover situations, but what happens when you need to downsize your presentation over a 20 foot deep rockpile? And certainly an extra heavy swimbait rod is not going to do you any good if you need to fish finesse worms. 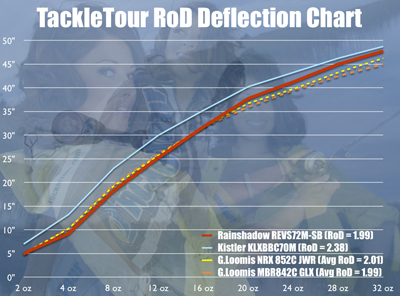 Fig 1: This chart illustrates the deflection characteristics of our REVS72M-SB Sample rod. You can see by this chart, that the blank's behavior is very much inline with the other Medium powered rods on this chart. The rod Batson sent over to us is a 7'2" medium powered stick, so let's assume our application calls for a good, open water multi-purpose rod. We're talking rip baits, medium to shallow running cranks, and lighter Texas rigged soft plastics and jigs. A medium powered rod would suit that purpose just fine.